In 2018, Grain Alliance (Baryshivska Grain Company) began retrofitting the equipment. 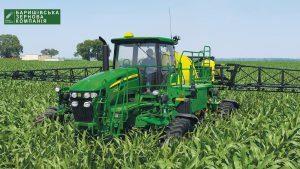 To achieve the aim, the North Poltava region of Baryshivska Grain Company has received two self-propelled John Deere 4730 sprayers and all Kinze seeders have been equipped with precision seeding systems. The Southern region has undergone a complete re-fitting. Now they’ve got Precision Seed Drills Tempo L Väderstad, Pöttinger Terrasem Drills and John Deere 8345R Tractors. – The main advantages of new technology сonsist in high power, efficiency factor and productivity. These are the best conditions for the operators to work, which is important to us. They are switching to a new technology of cultivating technical crops with a spacing of 50 centimeters in the Southern region of Baryshivska Grain Company. In total, it is planned to sow more than 6 thousand hectares with crops using the new technology. 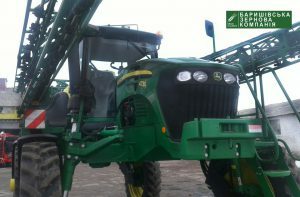 New machinery has been acquired for this reason, – said Ivan Barannik, the head of Pyryatyn Maintenance Service Center. 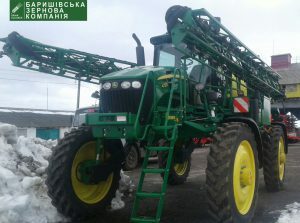 One more step to the technical update is the delivery of a self-propelled John Deere 4830 sprayer from the USA. It will be completed in the Pyriatyn Service Center and sent to the Kyiv region of the company. – This year we are planning to complete the first stage of the re-equipment of the Baryshivska Grain Company’s agricultural machinery park. In our opinion, this is an important step for further growth. Preserving the fertility of the Ukrainian land using the most advanced technologies is one of our main long-term tasks, “-says Evgeniy Radovenyuk, the company’s CEO.